Sakasa Kebari tied by Amano-sensei, free-hand, with no tools and eye-less hooks. Sakasa Kebari hold quite a esteem here. 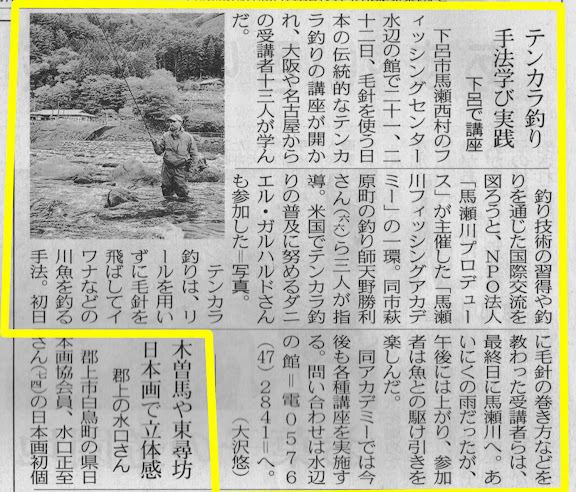 It’s been 12 days since I arrived in Japan seeking to learn more about tenkara and experience the mountain fishing culture of Japan. This is my third visit to Japan, and each time I continue to learn more and more about tenkara. Who knew such a simple method of catching food would have so many subtleties to keep me coming back! Tenkara and Tenkara USA for me are much more than selling fishing rods and other items; I’m very passionate about sharing the method of fishing with you. I’m happy to be writing this and working on videos, pictures and other content from my new room overlooking the mountains of Gifu. I will try to find time between fishing and hanging out with the people from the area to share what I learn on the blog. Rainy days like today are perfect for that. After about a week of travelling, I have now been settled in what will be my home for the next month and half in the small mountain stream village of Maze, on the Maze River in Gifu, Japan. It’s a beautiful, idyllic setting. Very inspiring. Out of 12 days in Japan I think I have fished on 8 of them. I can’t say enough about how beautiful the streams here are, I absolutely love them. Crystal clear water, emerald gems with movie-like settings of cedar forests and mossy rocks. But,unfortunately, I’m quickly acquiring a new appreciation for the streams in the US and sometimes I wish I could mix the best of both worlds, where regulations, and stream management and keep-limits would make the rivers here more productive. Rivers don’t have a keep-limit and the concept of catch-and-release is virtually unknown – though I revisited the Itoshiro River, a very productive C&R river about 1 1/2 hours from here. Out of the many stretches of streams I have fished in this area, few showed much sign of life. I did catch fish just about every day, but it was hard work! Conditions are good, insect life very abundant, but the fish seem to be mostly gone. A shame, but we’ll see what I find deeper in the forests. 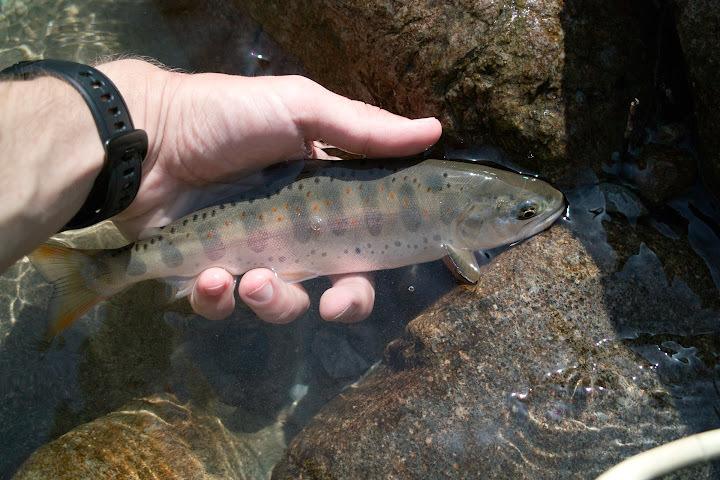 A beautiful example of an Amago, a native, though seemingly rare fish. My host, Rocky Osaki, manager of the Mazegawa Fishing Center, and his wife Ikumi, have taken great care to introduce me to the community of both anglers and non-anglers in the region. I have been blessed to be invited into numerous homes where I soak all I can about tenkara, fishing culture and other aspects of life here. And, of course, have been soaking on the local onsen every chance I get. A local kid whom I just had to nickname “Sanpei”, he doesn’t seem to mind. This weekend there was a wonderful event here. 3 tenkara masters, and I do not use that word lightly, taught a course on tenkara to a group of about 15 people. 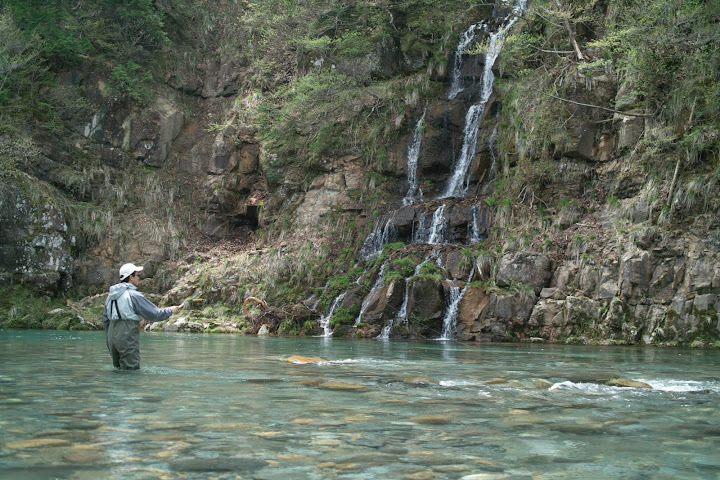 I spent most of my time with Amano-sensei (more on him later, but quite a character and a most skilled tenkara angler).From each of them, as well as other very experienced tenkara anglers, I have learned more about tenkara. The smile on your face in the group photo says it all. I can tell your having the time of your life. The pictures of the post leave me wanting more, and that Amago is quite beautiful. Thanks for checking in and take care. Looks like you’re having the time of your life Daniel. The photo of you and the group taking the course is one you’ll treasure for the rest of your life. I know I would. Keep the reports of your adventure coming as we find them interesting and beautiful and thanks for sharing your time there with us. “Who knew such a simple method of catching food would have so many subtleties “. The motto at the top of the tenkara.ru forum sums up that idea quite nicely – “tenkara – complex simplicity”. The motto , I believe, is authored by Dr. Trout, who occasionally post on the forum here. Looks like a great experience. Thanks for posting the update. The fly featured on top of the is probably the two-handed fly you talk about, as it has to be tied with both hands. It’s actually interesting that it can be a bit difficult to find eye’d hooks here. I went to a tackle shop the other day and they only had eyeless hooks. I asked Amano sensei about the eyeless hooks and why he uses them, he says he uses them because (a) they are cheaper, (b) he feels that the hard eye is a strong shock area and the line may break at the knot when tied to the metal eye. They are quick to tie as well with practice, it’s a very quick extra step to add the silk line as the eye. I doubt I’ll be tying many of them in the future, but they do look pretty cool. Looks like a great time! I too find the eyeless hooks very interesting! Anyway you can talk Amano sensei into doing a quick video for us?